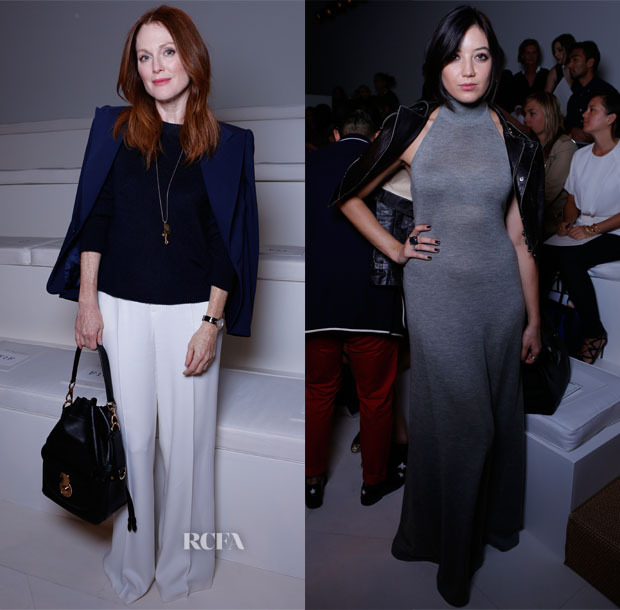 Ralph Lauren showcased his Spring 2015 collection on the last day of New York Fashion Week on Thursday (September 11) with Julianne Moore and Daisy Lowe in the front row, who served up very different looks. Julianne Moore: As you would expect, her look was fiercely classic, opting for chic Ralph Lauren Collection separates in muted shades. This look would work just about anywhere such is the easy nature of her styling. The only thing I would change is the pant length to graze rather than puddle on the floor. Daisy Lowe: The model took a gorgeous heather-grey Ralph Lauren Collection dress and made it her own, giving it an edge with a black leather Ralph Lauren jacket and leather boots thrown into the mix.